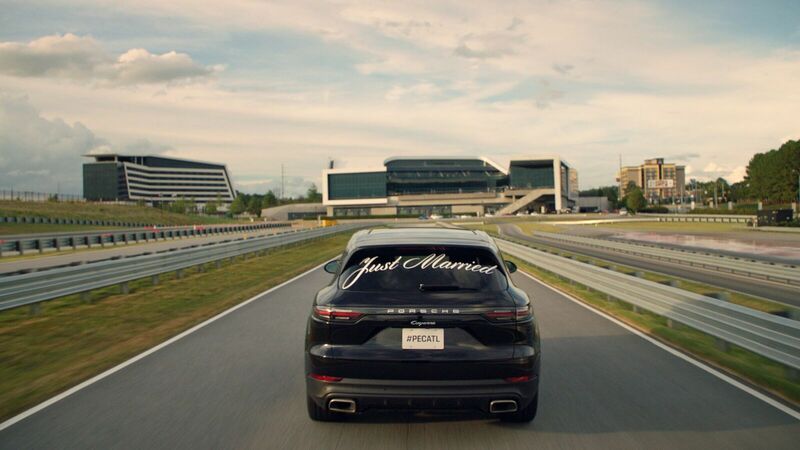 Two Porsche owners show their love for the brand—and each other—by getting married in the backseat of a Cayenne traveling 70+mph on a racetrack at the Porsche Experience Center in Atlanta. The stunt is the latest installment of the brand’s “Sportscar Together” campaign. Earlier this summer, the campaign featured Sportscar Together Day, which helped celebrate Porsche’s 70th anniversary as well as a unique Carpool Karaoke partnership with Adam Levine and James Corden in a Porsche Cayenne. The real-life wedding, orchestrated in partnership with The New York Times’ T Brand Studio, is a slight shift in focus, targeting a younger, more female audience through the story of one real-life couple’s shared love for Porsche. The company’s first wedding was a successful test run for other potential opportunities, says Klaus Zellmer, president and chief executive officer of Porsche Cars North America. Key to those opportunities is the Porsche Experience Center, whose locations “serve as track-based brand embassies where visitors can indulge in everything Porsche,” according to company marketing materials. The couple’s Save-the-Date debuted on the New York Times hub Sept. 14. The longform wedding video launches live Nov. 7. The campaign will also appear on Porsche’s social media channels, in a Times print ad on Nov. 18, via paid posts on NYT.com and via Times social posts on Facebook, Instagram and Twitter. The wedding activation was conceived by Porsche’s creative agency Cramer-Krasselt and executed with media agency PHD for the new 2019 Porsche Cayenne. The campaign targets driving enthusiasts across the spectrum, says Chris Hanley, senior vice president and group account director at Cramer-Krasselt.